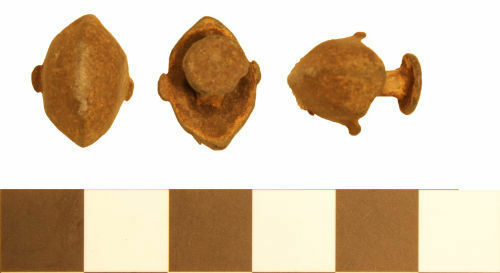 A copper-alloy stud, probably from a belt dating to the Roman period. The stud possesses a head which is lentoidal in shape and is almost triangular in section. Two opposing semi-circular lugs extend from the head, possibly casting sprues. From the underside of the head, there extends a circular-section lug which terminates in a flat, circular end plate. The stud head measures 16mm in length, 12mm in width and 8mm in thickness. The length of the stud is 15mm. The diameter of the lug is 2mm and the end plate 6mm. It weighs 4.85g.